October was a busy month at Sisters. This wedding was a highlight for us. Jazzy and Brian were married on October 10th. 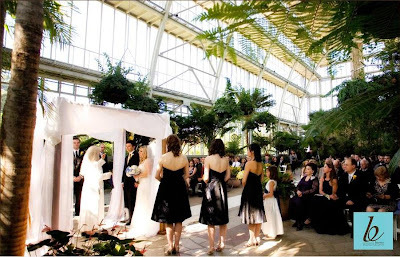 They had their ceremony at the Jewel Box and their reception at the City Museum. Here are some awesome detail shots from Burns Photography. 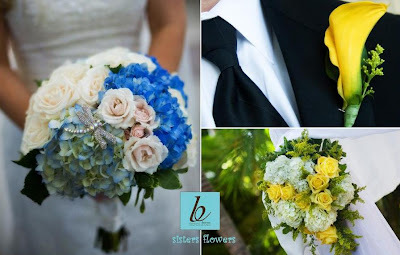 Jazzy’s bouquet was blue and white–hydrangeas, roses, and a dragonfly pin. Yellow was the accent color used in the bridesmaids’ bouquets and on the chuppah. 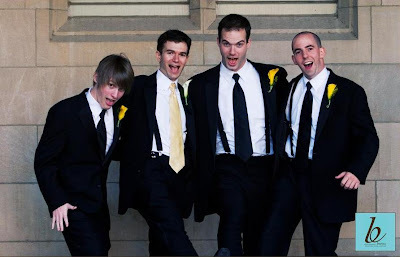 The guys all had mini calla bouts.–white for the groom and yellow for the groomsmen. Our chuppah at the Jewel Box. The head table was lined with yellow and white flowers over the blue table runners. Tall and short centerpieces decorated the guest tables. And here’s where the books come in…..various yellow books were stacked underneath blue cubes of yellow flowers on some of the guest tables. Tall spheres of blue and white flowers topped trumpet vases on the opposite guest tables. 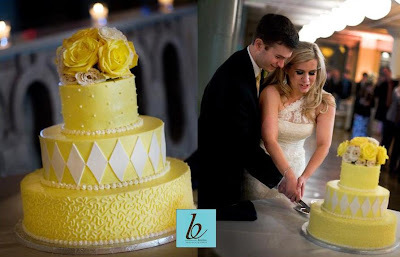 Yellow and white flowers accompanied this bright cake. 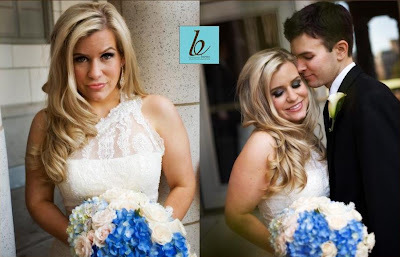 Special thanks to Shayna of St. Louis Wedding Consultants for coordinating this bright and unique event!! Best wishes to Jazzy and Brian for a wonderful first year together and many more to come!